The Giro del Lazio has been reborn as the ‘Roma Maxima’ after an absence from the race calendar since the Italian one-day race’s last edition in 2008. Roma Maxima will take place in and around Rome, Italy, on Sunday March 3. The race commences in the Roman Forum and then travels via Via Appia Antica, Castelli Romani through Rocca Massima, Rocca Priora, Campi di Annibale, Albano Laziale, Cappuccini before finishing near the Coliseum on Via dei Fori Imperiali. Race organiser RCS Sport also announced the list of 16 teams taking part in Roma Maxima: Ag2r, Androni Giocattoli, Astana, Bardiani Valvole, BMC Racing, Caja Rural, Cannondale, Colombia, Crelan-Euphony, IAM Cycling, Katusha, Lampre-Merida, Movistar, Argos-Shimano, Vacansoleil-DCM and Vini Fantini-Selle Italia. The name ‘Roma Maxima’ was the result of an online competition where 140 proposals were submitted from 22 different countries, according to RCS Sport. “The name ‘Roma Maxima’ shows the magnificence of Rome and the image of the city to the world, reflecting values that are easily recognised abroad from the cycling community and beyond,” said a press statement. RCS Sport operating director Mauro Vegni said: “The Giro del Lazio has always been a jewel in the crown of this region and of international cycling. For many reasons it hasn’t been raced since 2008, but we never forgot it. We put a lot of thought into re-branding, as is shown by the new name and logo. 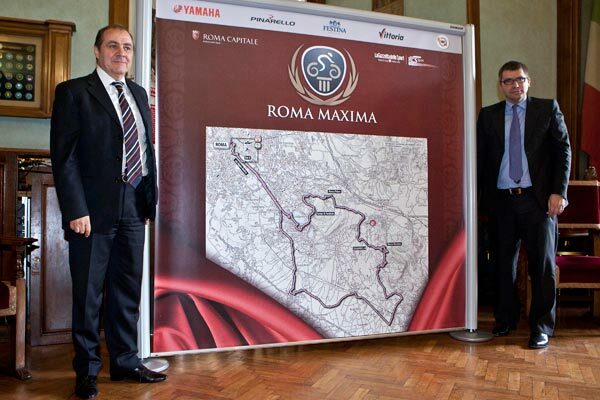 “Roma Maxima is a project that sees Rome at the centre of it, and wants to become a key event in the international racing calendar. “The day of the race, Sunday March 3, is immediately after the Strade Bianche, a race also organised by RCS Sport/La Gazzetta dello Sport. The aim is to make an incredible weekend of cycling in some of the most amazing scenery in the world, unifying ‘Chiantishire’, Siena and all the beauty of Rome in a unique surrounding for the global sport.